EP President declares that terror representatives and former terrorists will no longer be allowed to participate in parliamentary events. About two months after the participation of terrorist Leila Khaled as guest of honor at the European Parliament, President of the Parliament Antonio Tajani on Wednesday announced that representatives of terrorist organizations or former terrorists would not be allowed to participate in the Parliament. The announcement came after a move led by MEP Anders Vistisen - accompanied by legal counsel Yifah Segal, director of the International Legal Forum (ILF) - who handed to the President a letter signed by 60 members of Parliament, quoting European Union laws and guidelines proving that Khaled’s visit violated them. 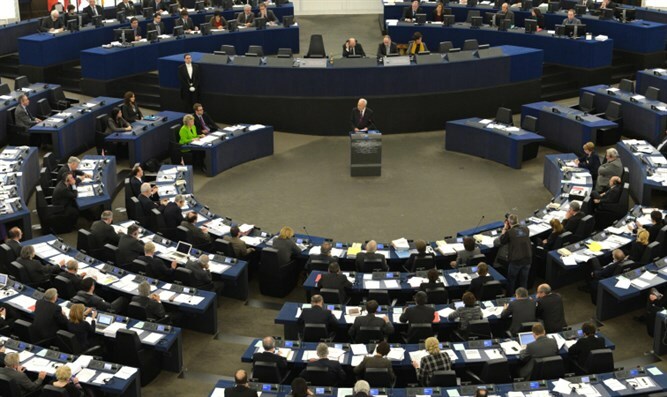 In his reply to MEP Vistisen and the Legal Forum, the President approved the laws and understandings mentioned in the letter and confirmed that there would be no further participation of terrorist representatives or former terrorists, as defined by the EU’s list of terrorist organizations, in the Parliament. "The fact that the Popular Front (PFLP) has been on the EU's list of terrorist organizations for years has not stopped factions in the European Parliament from hosting representatives of the organization in parliament, providing a respectable platform for disseminating its messages of hatred, violence, and anti-Semitism," said Yifah Segal, director of the ILF. “In the process in which we had the privilege of taking part, we wanted to demonstrate how this practice blatantly violates guidelines and rules of the EU itself. This important decision defines what sounds to the Israeli ear as obvious, but which has been possible until now without any sort of limitation in EU institutions,” she added.